Crown Equipment Corporation announced today the Crown C-5 Series, which is the first company-manufactured internal combustion (IC) forklift. The Crown C-5 features an industrial engine, a proactive approach to engine cooling and radiator clearing via an on-demand cooling system and design innovations that improve operator visibility, comfort and productivity. Internal combustion forklift users have been struggling with issues related to engine performance, overheating, operator comfort, and costly maintenance and downtime. Sub-par performance was one of the predominant downfalls of existing IC forklifts that rely on automotive-style engines and inadequate braking systems not designed for tough industrial applications. Another downfall of existing IC forklifts was overheating and inefficient cooling that hampered engine, transmission and radiator performance and subsequently increased maintenance costs and reduced uptime. Multiple challenges associated with comfort, stability and visibility hampered the drivability of existing IC forklifts. For example, ergonomic tests showed operator pressure points in traditional IC forklift seats created discomfort and reduced productivity for operators spending most of their day on the forklift. 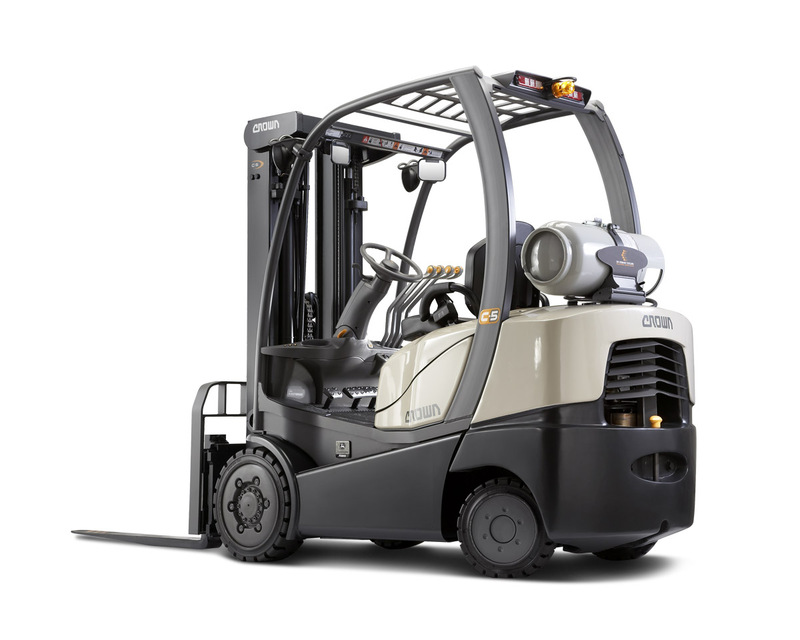 Crown Equipment Corporation announced the availability of the Crown C-5 Series internal combustion (IC) forklift; this is Crown's first manufactured IC forklift. The Crown C-5 features an industrial engine, a proactive approach to engine cooling and radiator clearing via an on-demand cooling system, and design innovations, such as power brake system, that improve operator productivity, comfort and visibility. A co-development project with John Deere Power Systems produced a 2.4-liter industrial engine for the Crown C-5 that features a cast iron head and larger, more robust components that are designed to prevent overheating and warping while extending the product's lifespan to twice that of existing IC trucks. A standard feature on the Crown C-5 - but uncommon for standard versions of existing IC trucks - is a dual open-core radiator with separate cooling systems for the engine and transmission. Crown engineered an optional and exclusive On-Demand Cooling (ODC) system that automatically clears itself of debris and provides precise cooling to effectively manage heat in intense and dirty environments. Crown eSmart™ Accurate Fuel Tracking, an industry first, alerts the operator when the system senses 16 minutes of remaining fuel time and continues to track fuel time as the tank nears empty. Crown designed and built its patented FlexSeat™ after identifying drivability challenges and conducting ergonomic tests to identify pressure points in traditional IC forklift seats. In its first 2,000 hours of operation, the Crown C-5 is designed to average just 79 routine maintenance tasks, which is 87 percent less than some of the IC trucks currently in use. The self-adjusting power brake system on the Crown C-5 has fewer moving parts and a 90 percent larger brake pad surface than traditional drum brakes, which translates into a lifespan that is three times longer and requires 93 percent fewer maintenance checks. The power brake system is a standard feature on the Crown C-5 6,000 and 6,500-pound models. Our customers came to us with internal combustion forklift issues related to engine performance, overheating, operator comfort and maintenance. Our fresh perspective on these problems, combined with extensive research and development, and our 50-year legacy of innovation and material handling expertise, allowed us to create a truly industrial forklift. We saw an opportunity to help our customers move beyond the existing limitations of IC truck performance. People generally don't drive their cars for eight to 16 hours a day, six days a week. In fact, running an automotive engine in a forklift for just 2,500 hours is the equivalent of driving 100,000 miles at 40 miles per hour in a car. An automotive engine just isn't built to withstand the demands of many material handling environments. A manufacturing, agricultural or construction setting is a better proving ground because you've got dirt, debris and longer run times. With this industrial engine, the Crown C-5 can handle hotter, more demanding applications. Each time a user starts the Crown C-5, the optional ODC system's radiator-clearing feature reverses the fan direction to dislodge any debris. This drastically reduces the frequency of radiator cleanings, which reduces maintenance costs and increases uptime. As we talked with Crown Equipment about the possibility of jointly developing an industrial engine for its new internal combustion forklift, we knew we had an opportunity to create something innovative for the material handling market. The cultural similarities of both companies created an environment for innovation that really exceeded our expectations. The engine we've developed for the Crown C-5 integrates John Deere's extensive experience in engineering and manufacturing industrial diesel engines with Crown's five decades of material handling experience. The result of our collaboration is an innovative engine that is built specifically for IC forklifts. Crown is one of the world's largest lift truck manufacturers. Crown's award-winning line of lift trucks maintains a reputation for exceptional product design, engineering and manufacturing. From the smallest hand pallet truck to the highest lifting turret truck, Crown seeks to provide users with safe, efficient and ergonomic lift trucks that lower total cost of ownership and maximize uptime. Headquartered in New Bremen, Ohio, Crown manufactures lift trucks that are sold throughout the world. For more information, visit http://www.crown.com. Crown C-5 SeriesThe Crown C-5 Series is the first company-manufactured internal combustion (IC) forklift.